April 12th, 2014 started as a normal Saturday in Boston. Then, all of a sudden, I was rushed to the battlefield of the PAX East show floor. Sweat flinging, smells permeated and it was all a blur to me. We lost good men that day but there is still hope on the battlefield. That hope is Valiant Hearts: The Great War from Ubisoft that follows the lives of five different soldiers set in the trenches of World War I.
Don’t worry, their rendition of the battlefield is well crafted and immersive, and it reminds me of a classic PBS documentary. The demo on the PAX East show floor only explores two out of the five soldiers: the cook and the american. The cook sequence also involves a dog that is a large part in both the mechanics and the storyline. Both characters pass through the different battlefields trying to remove obstacles in their way, such as a gun turret and a large ammo crate. Each section ends with a shot of the war that continues to rage on. 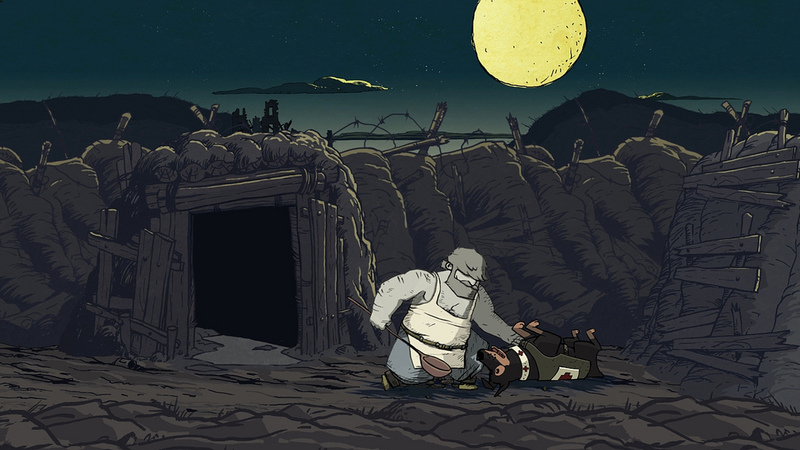 Valiant Hearts: The Great War’s most notable aspect is the fantastic art direction. Every screen is high quality and in motion; the art style looks like a fully animated film. Since dialogue in the stories is non-existent the art style and the world has to tell the harsh story of trying to survive in the trenches. At first the style can be labeled as “cartoon-ish” but as soon as artillery hits your base the serious nature of the world sets in. Gameplay follows the formula of the new wave of adventure games such as Machinarium where each area is about finding which objects in the environment can be interacted with and the “walk and interact” gamepad controls are slow but deliberate. The advantage comes with the dog where you can direct him to go where the main character cannot. This mechanic is not used a lot in the demo but combined with a throwing ability offers more possibilities for puzzles in the larger game. 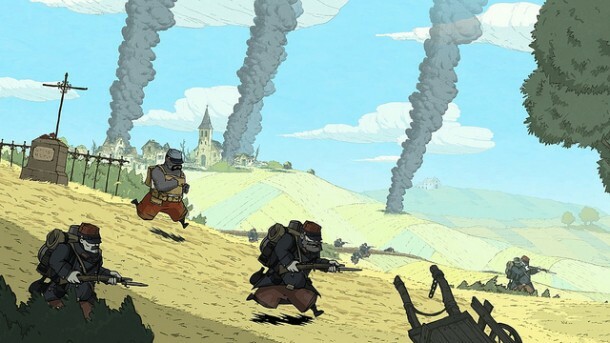 Valiant Hearts: The Great War is not a game you would expect to come out of Ubisoft but that is perhaps a great achievement. The story and art style is a great combination, highlighting the irony that is war. Valiant Hearts comes out for most major platforms later this year and it should definitely be on everyone’s radar.